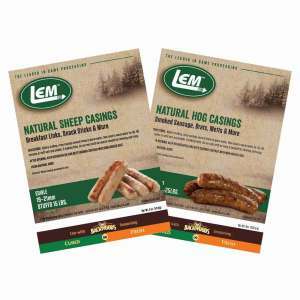 Here at LEM, we take our sausage casings seriously. From huge summer sausage all the way down to snack sticks, size doesn't matter to us. We've got all of the sausage casings you'll need for your next sausage adventure. If you're not quite ready to jump right in to the deep world of sausage casings, we've got all the information you could want to know. Don't just wing it - brush up on the types of sausage casings below, and the types of sausage you'll make with them. Oh - and one other thing... Always practice safe stuffing! Collagen Casings are made of beef protein. These casings are a natural product that is manufactured into casing form. Collagen casings are both edible and non-edible. Non-edible are tied at one end. They can be clear or mahogany in color, printed or unprinted. There are several variations of collagen casings: fresh, smoked or processed, snack stick, rounds, or middles. » Preparation: No soaking needed. Use right out of the package. » Cooking Method: These are made stronger to be hung in a smoker, but can also be cooked in the oven or dehydrator. » These will shrink somewhat if used for fresh sausage and may burst upon grilling or frying. » Pleated into long tubes and holds anywhere from 6 - 28 lbs. per strand depending upon the size. » Preparation: No soaking needed, use right out of the package. » Cooking Method: These are made stronger to be hung in a smoker, but can be cooked in an oven. » Clear or mahogany in color. » Pleated into long tubes and holds anywhere from 6 - 10 lbs. per strand depending upon the size. Old Fashion Collagen Middles (Non-Edible) are made of beef protein. 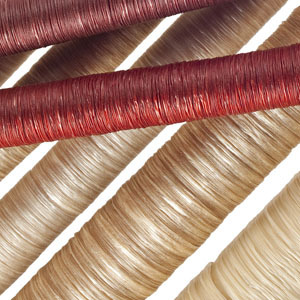 These casings eliminate the loose wrinkled look you get with Fibrous Casings. These casings are string tied. » Size: 1 1/2" x 18"
» Cooking Method: Can be hung in smoker or cooked in the oven until the internal temperatures reaches 165°. » Holds 1 - 1 1/2 lbs. per casing. » Shrinks with the meat to prevent wrinkling. » These casings will curve when stuffed. » Use for: summer sausage, trail bologna, bologna, salami, etc. » Size: 2" x 18" or 2 1/2" x 20"
» Preparation: Soak in non-iodized salt water for 3 - 5 minutes (1 gallon of water to 1 cup of salt). » Cooking Method: Can be hung in a smoker or cooked in the oven until the internal temperature reaches 165°. » Clear or mahogany in color, printed or unprinted. » Shrinks with the meat to help prevent wrinkling. Natural Casings are sheep, hog, and cow intestine. They come in a salted brine. They need to be soaked at least 1 hour in clear, warm water, and you need to change the water regularly. Soaking will make the casings more pliable. Flush casings to thoroughly remove all salt. Refrigerate after opening. Refrigeration will also help to eliminate the odor that naturally occurs with fresh casings. Natural casings will stay fresh on the shelf and in the refrigerator at least 1 year or longer, as long as they are kept in brine in an airtight bag or container. If casings are cleaned and then not needed, merely pour salt over them and seal in an airtight bag or container. These casings are edible and can be broiled, grilled, or fried. They will provide a "pop" when bitten into. » Preparation: Soak at least 1 hour in clear, warm water, change water regularly. Fibrous Casings are made of plant cellulose. Think tea bag. These casings are non-edible. They will hold anywhere from 1 to 6 lbs. per casing, depending on size. They are tied at one end. They can be clear or mahogany in color, and printed or unprinted. Prior to use, these casings must be soaked in water for 20 - 30 minutes to make them pliable and easy to use. » Use for: summer sausage, salami, bologna, trail bologna, etc. » Size: 1 1/2" x 12", 1 3/4" x 24", 2 1/2" x 20", 4" x 20"
» Preparation: Soak in warm water 30 minutes prior to using. » Tied at one end and will hold anywhere from 1 - 6 lbs. Smoke Flavored Casings are plastic casings that have a smoked flavor lining. These casings are impermeable, so liquid cannot escape. Use less water when using plastic casings. Do not soak these casings prior to use. » Size: 2" x 14", 3" x 20"
» Clear, can look like a caramel color due to smoke lining. » Tied at one end and will hold 1 1/2 - 3 lbs. 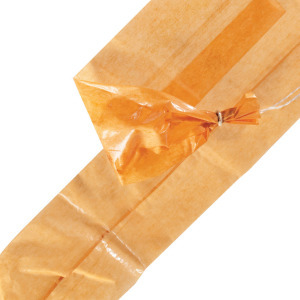 High Barrier Casings are made of a nylon/poly blend. They are very user friendly and are great for beginner sausage makers. They are tied at one end. These casings are impermeable so liquid cannot escape. Use less water when using plastic casings. » Size: 1 1/2" x 5" or 2 1/2" x 20"
» Preparation: Soak for 30 - 60 minutes in cold water prior to use. » Cream or gold in color. » Holds 1 1/2 - 2 1/2 lbs. per casing. 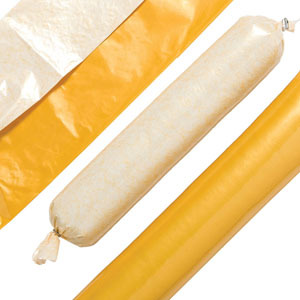 Hot Dog Casings are available as Collagen Edible Casings or available in Non-Edible Plastic. Use these to make good ol' fashioned franks. LEM Non-Edible Plastic Hot Dog Casings are Kosher certified. » Cooking Method: boil or smoke until internal temperature reaches 165° - do not use in an oven. » Red or clear in color. » Holds anywhere from 27 - 28 lbs. of hot dogs per strand. » Pleated into long tubes. Need More Information About Sausage Making? Still deciding which Casings to use for your sausage? Download our handy chart on Choosing the Perfect Casing. Smoking the perfect sausage? Click here for Smoking Information. Need help troubleshooting problems with Casings? View Troubleshooting Casings here.